Before telling you about these Vegan Cinnamon + Mandarin Charlie Brown Thanksgiving Cupcakes we gotta go to that good ol' disclaimer: Housevegan.com is a participant in the Amazon Services LLC Associates Program, an affiliate advertising program designed to provide a means for sites to earn advertising fees by advertising and linking to Amazon.com. This post contains Amazon affiliate links. This month has been rough, right? Like most of the country I was thrown off by our recent election, and needed ways to cope with how I was feeling. My method was to turn everything off and clean. I cleaned our pantry, our fridge, our freezer. I cleaned under our bathroom sink, and then deep scrubbed our tub. I washed our walls, and cooked mountains of seitan. I turned toward domesticity because it gave me a sense of control and allowed me to be helpful to my loved ones at a time when I felt totally powerless. To be honest, writing about Thanksgiving food just felt frivolous in that moment. While I don't regret taking the time I needed, I don't truly believe that it's frivolous. Maybe it is in the grand scheme of things, but it isn't to me. Writing about my food connects me to you beautiful people, and throughout my break that is what I've missed the most. So here I am with cute cupcakes to share. 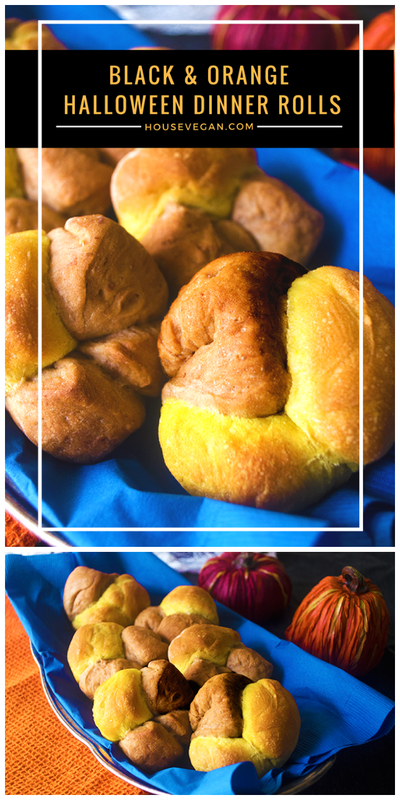 Because no matter what has happened, things like vegan Thanksgiving and Charlie Brown holiday specials still bring me joy, and I hope that if you're struggling my silly recipes can bring you a little joy too. Even if just for a moment. It should come as a shock to no one that I'm a big fan of Peanuts holiday specials. Both the Halloween and Christmas specials are classics for my family (and many families), and while the Thanksgiving special is not as loved as the other two, I adore it just the same. In the special, Charlie Brown is tasked with making Thanksgiving dinner for his friends, but since he's a child the meal he prepares consists of popcorn, pretzels, jelly beans, and toast. It's pretty adorable, and I think I like it so much because this is so something I would have attempted as a kid. I've always loved eating, and make-believe was my favorite kind of play growing up. 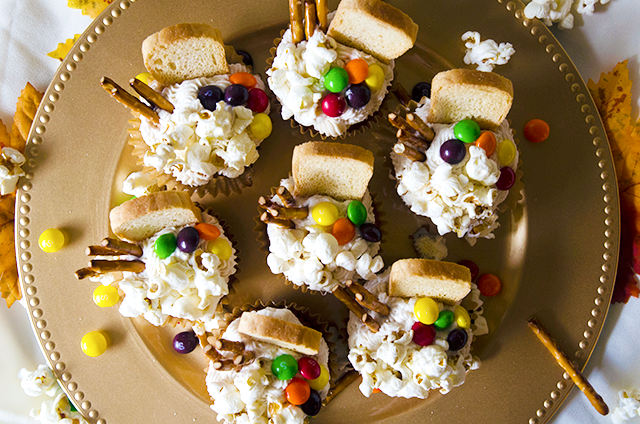 I could see myself serving my friends a Thanksgiving meal made entirely of random snacks. 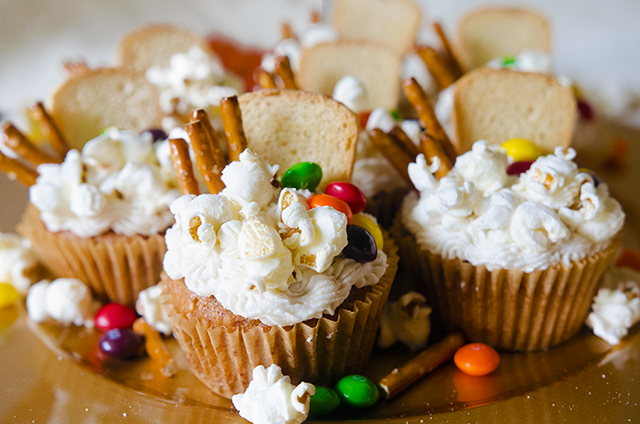 I've had these cupcakes on my to-make list since Just Jenn's version few years ago, and I'm glad that I waited until I was halfway decent at food photography to make them. I just think they're gorgeous! 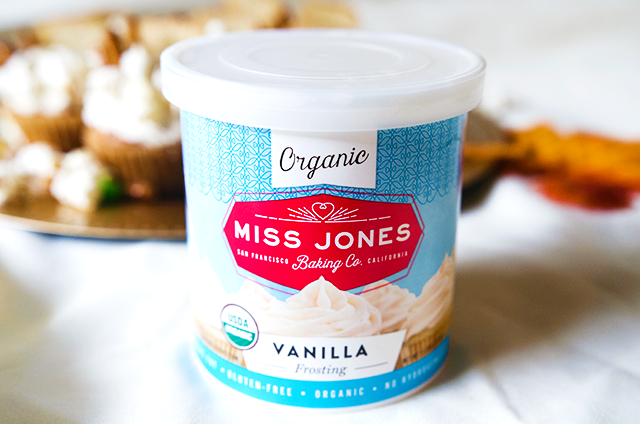 I altered my Ground Hog Day cupcakes for the actual cupcake part, and I made things super easy by using this store-bought frosting from Miss Jones Baking Co.. I really hate making frosting, and I was so happy to see this vegan option at Whole Foods. I mean, yes a lot of Pillsbury frostings are vegan, and that's fine, but this one has like five ingredients so that's a plus. You can obviously use whatever cupcake recipe you want. The real star in this dessert is the toppings. 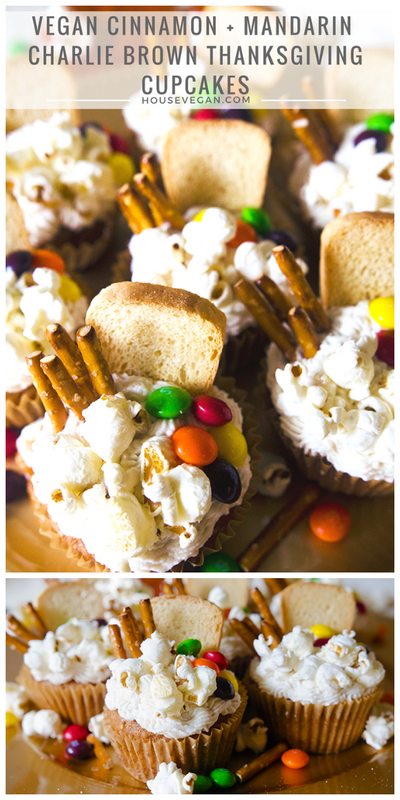 If you can find vegan jelly beans then definitely use those for these Charlie Brown cupcakes. They're widely available around Easter, but it's November so I was out of luck. Skittles made a fine substitute, but the perfectionist in me was none too pleased. However, in the spirit of the holiday I let it go. That's not an easy thing for me to do! With Thanksgiving upon us, I recognize that I find comfort in the normalcy of the holidays. No matter what is happening in the world, they're a good time to feel comforted and grateful. I'm angry and scared, but I'm so grateful too. I hope that House Vegan can be a space for anyone who just wants a moment to escape from the state of things while looking at food pics. And trust me, I have so many more food pics to share with you, friends. No matter where you are in the world, what religion you follow, how you look, what gender you identify as, or who you love, Happy Thanksgiving from my family to yours 💗. 1. Pre-heat your oven to 350°F, and line a 12-cup muffin tin with paper or parchment baking cups. 2. In a small mixing bowl combine the non-dairy milk and apple cider vinegar, and set this aside while you assemble the other ingredients. 3. In a large mixing bowl sift together the flour, corn starch, cinnamon, baking powder, baking soda, and salt. 4. In another large mixing bowl whisk together the sugar, oil, mandarin zest, vanilla extract, and milk and vinegar mixture until thoroughly combined. 5. Carefully pour the flour mixture into the sugar mixture, and use a spatula to fold the ingredients together until no large lumps remain. 6. Fill the baking cups two thirds of the way full with the cupcake batter. Place the cupcakes in the oven to bake for 20-22 minutes, or until a toothpick inserted in the middle of one comes out clean. Allow them to cool completely before decorating. 7. When the cupcakes are totally (100%) cool start decorating. Pipe or spread a layer of frosting on the top of a cupcake. 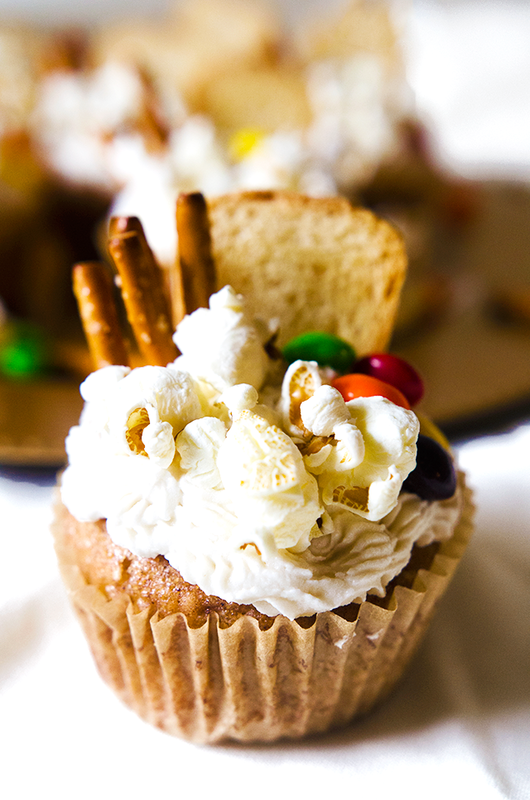 Top the frosting with a few popcorn pieces, jelly beans or skittles, and pretzel halves. 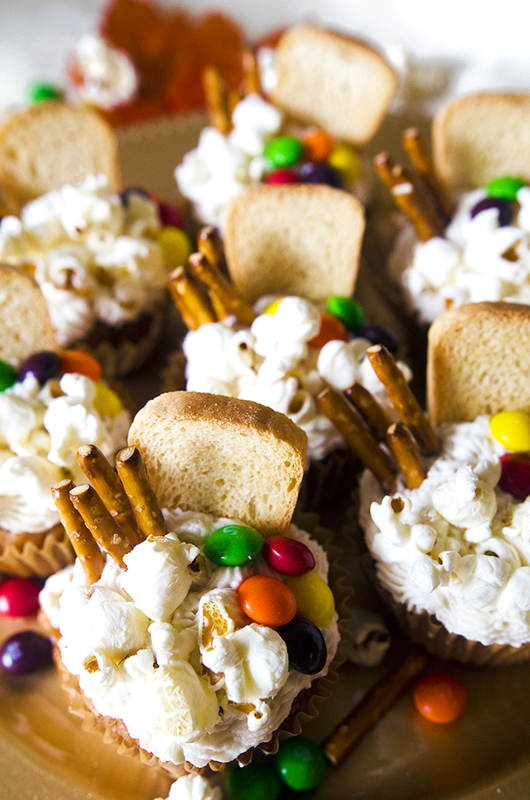 Add one piece of toast to each cupcake. Serve!